Australia has the highest minimum wage in the developed world, according to the Organization for Economic Co-operation and Development (OECD). Its after-tax rate of $9.54 per hour is followed by Luxembourg with $9.24 and Belgium with $8.57. "They have a high minimum wage. And interestingly they have a low tax burden," Herwig Immervoll, the author of the OECD May report said. "[Australians] recognize that supporting low wage earners through the tax system is important." Ireland and France are among the top five countries with minimum wages of $8.46 and $8.25, the OECD said. The United States was ranked 11th on the list, with a federal minimum wage of $7.25 per hour. Mexico is bottom of the list with the lowest take-home minimum wage of about $1 per hour. The report, based on the latest OECD data from 2013, ranked 27 countries that have laws setting a nationwide minimum rate of pay. Eight countries from the 34-membered OECD, such as Finland, Sweden and Switzerland, were not included in the report because their governments do not set national rules on minimum pay. They have strong labor unions and their employees are covered by sector-level collective agreements. Net income for minimum wage earners varies enormously between countries, the report showed. A single Australian minimum wage employee with two kids can work just 6 hours per week to stay above the poverty line, as the family will also receive state benefits. Meanwhile, in the US an employee needs to work 50 hours per week to escape poverty. Czech Republic, Estonia, Greece and Spain are the EU countries where full-time work by two people on minimum wages is not enough to get a family above official poverty levels. The minimum wage in Australia has increased almost every year since the late 1990s, as the economy benefited from a commodities boom. At the same time, unemployment fell, and remained below 6 percent for more than a decade through the middle of 2014. The minimum wage for workers older than twenty was 60 percent higher last year than it was in 2000. 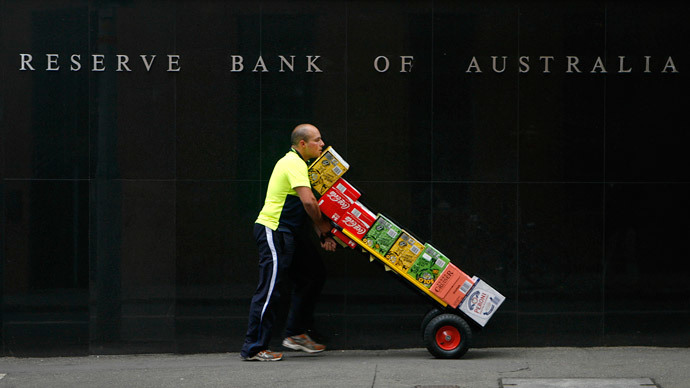 Australian wages excluding bonuses rose 0.5 percent in the first quarter of 2015 from the preceding quarter and 2.3 percent from a year earlier, the Australian Bureau of Statistics said Wednesday.